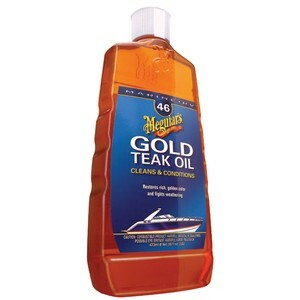 Meguiar's Teak Oil is engineered to protect your boat's teak while rejuvenating the rich and natural colors of the wood. Meguiar's Teak Oil is engineered to protect your boat's teak while rejuvenating the rich and natural colors of the wood. It's made to prevent the wood from drying out due to exposure from the elements. Perfect for your boat's bulkheads, hatch covers, swim steps, grab rails and decking.